(20:00:15)AmosShi与所有人说:To: 搞不定 --> You should do it earlier. (20:03:58)*umlchina2与JimmyNilsson说:successful story on the application of DDD methodology? (20:05:01)*umlchina2与JimmyNilsson说:tianshi612与所有人说:Is DDD mothodology related to MDA?DDD方法和MDA 有关系么? (20:05:57)JimmyNilsson与所有人说:Q: "Is DDD related to MDA?" (20:06:12)JimmyNilsson与所有人说:Well, I think they are in some sense, but the differences are big. (20:06:55)JimmyNilsson与所有人说:For example as I understand MDA it's relying heavily on UML as an executable UML. (20:07:15)JimmyNilsson与所有人说:For DDD, UML is also used, but much more as a way of sketching. (20:08:11)JimmyNilsson与所有人说:...try out the sketched model, refining it in the code editor instead. (20:09:32)worldheart与JimmyNilsson说:Can you talk about AOP and DDD? (20:13:05)*umlchina2与JimmyNilsson说:Q no.3: Is there any large scale project successful story on the application of DDD methodology? (20:13:21)*umlchina2与JimmyNilsson说:Q No.4:Is there any good practice in the extract and orgnization domin pattern? (20:13:57)*umlchina2与JimmyNilsson说:and how it controls its memory access? (20:17:13)JimmyNilsson与所有人说:Q: "How many clients would be supported by using O/R Mapping?" (20:17:32)JimmyNilsson与所有人说:Unfortunately the "boring" (but correct) answer is "it depends". (20:18:18)*umlchina2与JimmyNilsson说:Would you please provide us some good advice on maitaining the model integrity? (20:18:27)JimmyNilsson与所有人说:...in each request. And how often will objects be fetched. (20:20:21)JimmyNilsson_384与所有人说:Q: "How to maintain model integrity?" (20:20:44)JimmyNilsson_384与所有人说:First of all, I think the aggregate pattern can help quite a lot with that. 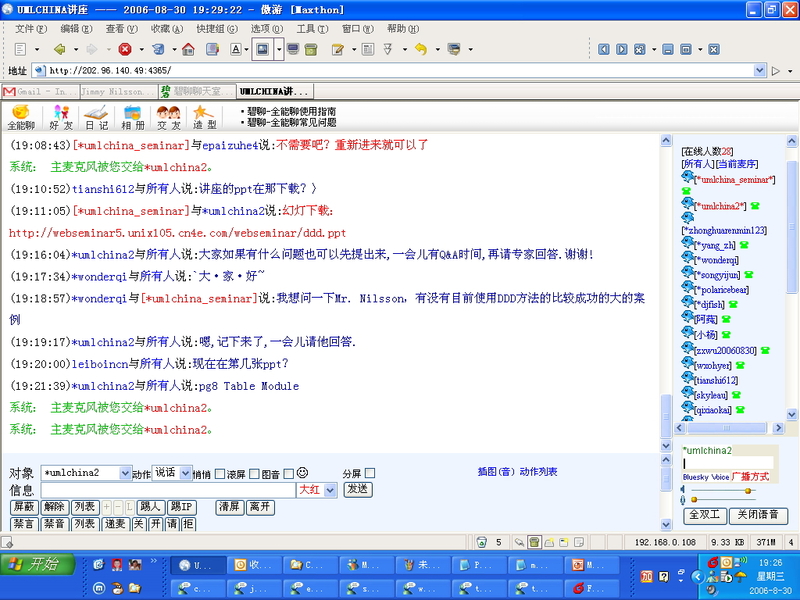 (20:23:28)JimmyNilsson_384与所有人说:This can be compared to how a word processor works. (20:23:49)JimmyNilsson_384与所有人说:You can misspell as much as you want, the word processor won't stop you from writing more. (20:24:02)*umlchina2与JimmyNilsson说:what is the memory cost required? (20:24:55)JimmyNilsson_384与所有人说:What I'm saying is that I think "context" must be remembered... During work, a misspell is fine. 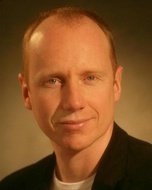 (20:25:12)JimmyNilsson_384与所有人说:When done, you probably don't want it there... The transition is important. (20:26:56)JimmyNilsson_384与所有人说:Well, the memory requirement of using O/R Mapping is very different depending upon product. (20:27:14)JimmyNilsson_384与所有人说:But lets talk a little bit about how it is regarding NHibernate. (20:27:54)JimmyNilsson_384与所有人说:One problem regarding memory and NHibernate is how detecting dirty objects are dealt with. (20:28:34)JimmyNilsson_384与所有人说:...when it's time for Flush(). (20:28:48)JimmyNilsson_384与所有人说:So at Flush() the snapshot will be compared to the current object in memory. Different? (20:29:24)JimmyNilsson_384与所有人说:But as always, there are solutions to that of course. (20:30:04)JimmyNilsson_384与所有人说:Identity Map of the session-object and therefore the snapshot will be gone. (20:30:20)JimmyNilsson_384与所有人说:That was just one of very many aspects regarding memory consumption of course. (20:32:50)*umlchina2与JimmyNilsson_384说:Is there any good practice in the extract and orgnization domin pattern? (20:33:07)*umlchina2与JimmyNilsson_384说:Would you please provide us some good advice on maitaining the model integrity? (20:33:30)JimmyNilsson_384与所有人说:Q: "Is there any good practice in the extract and orgnization domin pattern?" (20:34:02)*umlchina2与JimmyNilsson_384说:How many client side would be supported by O/R Mapping, and how it controls its memory access? (20:34:23)JimmyNilsson_384与所有人说:Let's see if I understood the question correctly. 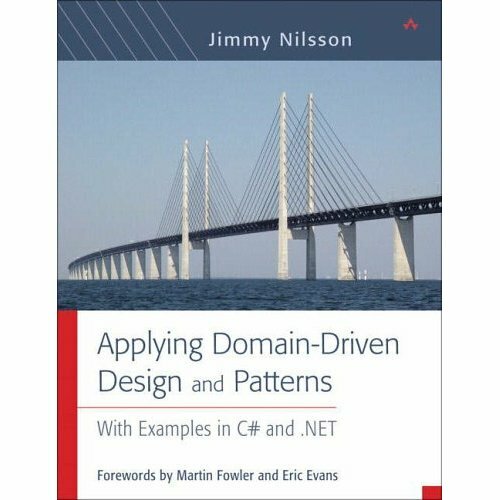 (20:34:53)JimmyNilsson_384与所有人说:I would recommend books such as the one I mentioned before about Archetype Patterns. (20:35:02)JimmyNilsson_384与所有人说:And Analysis Patterns from Martin Fowler. (20:35:39)JimmyNilsson_384与所有人说:But you can and should also read books that aren't from the IT field, but about the domain at hand. (20:35:42)JimmyNilsson_384与所有人说:That will help you a lot with organizing the domain logic! (20:36:07)JimmyNilsson_384与所有人说:Q: "Sometimes, object entitis is not map of table. how to deal with use Hibernate"
(20:36:52)JimmyNilsson_384与所有人说:The thing about NHibernate is more to be considered for situations when you have to. (20:37:22)JimmyNilsson_384与所有人说:And then NHibernate won't come in to play. (20:37:52)JimmyNilsson_384与所有人说:Please let me know if I misunderstood the question! (20:38:47)JimmyNilsson_384与所有人说:OK! What is causing you problems? (20:39:56)JimmyNilsson_384与所有人说:You mean that you have to think too much about implementation details up front? (20:40:55)JimmyNilsson_384与所有人说:when you have a database you have to use. (20:42:18)JimmyNilsson_384与所有人说:Oops, one sentence disappeared. :-) I'll try again. (20:42:34)JimmyNilsson_384与所有人说:Yep, so it's more the situation itself that causes you the problem, isn't it? (20:45:43)JimmyNilsson_384与所有人说:It's better supporting agility than Hibernate for your specific situation? (20:46:46)JimmyNilsson_384与所有人说:I *think* iBATIS is best when you have to adopt to an old database. (20:46:59)JimmyNilsson_384与所有人说:And/or when you want to have much control over the database access code. (20:47:45)JimmyNilsson_384与所有人说:NHibernate is a bit more magical... And might be a better fit if you start from scratch. (20:49:23)JimmyNilsson_384与所有人说:It's easiest if the database and the object model are as "similar" as possible. (20:49:40)JimmyNilsson_384与所有人说:Otherwise you will put too much energy into just that piece of the whole solution. (20:52:14)JimmyNilsson_384与所有人说:Q: "Any big projects built with DDD?" (20:52:15)*umlchina2与JimmyNilsson_384说:Is there any large scale project successful story on the application of DDD methodology? (20:53:41)JimmyNilsson_384与所有人说:such situations also. How to design the larger pieces so to say. (20:54:22)JimmyNilsson_384与所有人说:As long as you are very aware about the reality regarding implementation requirements. (20:55:05)JimmyNilsson_384与所有人说:But an O/R Mapper isn't at all a requirement for DDD... On the contrary. (20:55:25)JimmyNilsson_384与所有人说:It's just a tool for helping you with the implementation, if it's suitable. (20:59:29)*umlchina2与JimmyNilsson_384说:so. can you answer the last question as above?